This high protein quinoa salad has it all: crunchy celery, sweet oranges and tangy cranberries. It is a complete meal on its own. Its colorful appearance also makes it a lovely addition to any table as a side dish. I was inspired to make this recipe after trying dried cranberries in a salad made by my cousin Jenny. I love dried fruit as an ingredient in salads. The intense sweetness and chewiness adds a satisfying contrast to crunchy, fresh vegetables. The cranberries in this recipe are that perfect combination of extremely sweet and extremely sour. It’s easy to assume that kids dislike strong flavours. But just try offering them this dish and I guarantee they will love it. This is an ideal dish to serve during Passover because it does not contain Kitniyot. 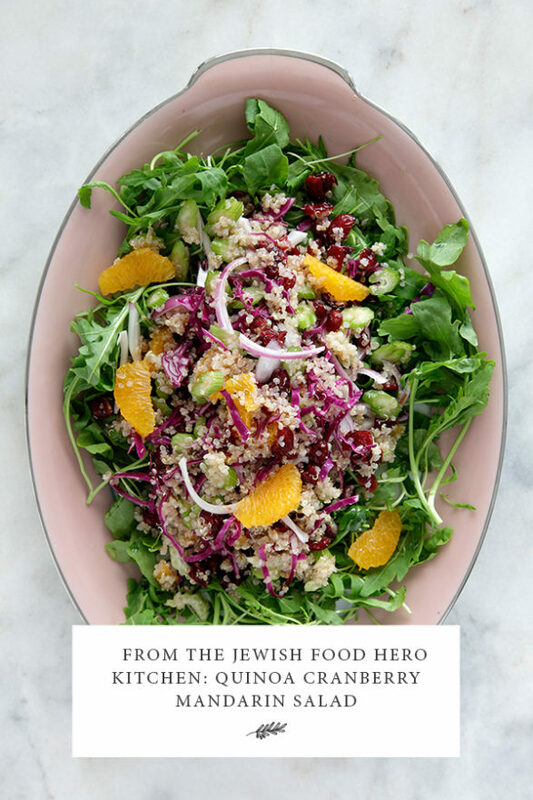 Since quinoa is technically a grass, it is a much needed alternative to our limited range of carbohydrates during Passover. Serving this for dinner during Passover would be a great way to relieve some of the heaviness and bloating we can experience as a result of eating all that Matza. Speaking of which, quinoa is high in fibre. Mixed with so many fresh vegetables this recipe is a Passover treat for our digestion. Omit the mandarin slices and fruit juice. Add chickpeas or any legumes you enjoy. Serve drizzled with the tahini dressing from the Jewish Food Hero Carrot and Cashew Salad recipe. Add more lemon and/or orange juice as desired… or…add to a glass of water and drink it! Serve over a bed of arugula or baby spinach if desired. You can dress the salad before serving, or put both bowls on the table so everyone can help themselves.